Why pay more at Whole Foods? 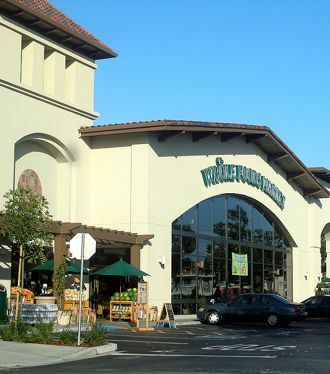 The exterior of the Redwood City Whole Foods in California. Is that a grocery store or a historic California mission? Photos courtesy of Wikimedia Commons. We’re talking this week about the power of The Experience Economy, the title of an important book that I described on Monday. The book’s principles explain why Whole Foods is able to survive, even though shoppers pay a lot more for a cart full of groceries—in the midst of tough times. The title of the book by Joe Pine and Jim Gilmore includes the subtitle: Work Is Theater & Every Business a Stage. I am old enough to remember when companies struggled to define quality. Today they struggle with how to stage great experiences. Yes, every business is a stage and those that recognize this will leave the others behind. Yet, just as every staged performance is not equal, the same is true of business experiences. Pine and Gilmore discuss the 4 realms of a great experience: Entertainment, Educational, Escapist & Esthetic. The realms are a result of two important dimensions: the level of guest participation (passive to active) and the kind of connection there is between the guest and the activity (absorption to immersion). Their bottom line is that great experiences have elements from all 4 realms. For years, grocery shopping was mundane—but not at Whole Foods! Just walking around a Whole Foods is entertaining. You can sample food, interact with knowledgeable staff and watch food being prepared. The education element is obvious. Every display is a mini-Wiki of food facts and food origins. Ever time yourself in a Whole Foods? It’s easy for shoppers to lose track of the time, a sure sign of the escapist realm. You can even stop and eat before finishing your shopping! Finally, the esthetic realm. Whole Foods is a feast of sensations. The stores are designed to be multiple places within one place. You walk into their flower shop, and pass next into the sights and smells of fresh fruits and vegetables, then it’s the sensations of a fish market—you get the idea. Now think of your local run-of-the-mill grocery store. Sterile straight rows of shelves, stocked with neatly stacked goods and the smell of—well, it’s often void of smell. Sensations, education and entertainment are all missing. The goal becomes getting in and out as quickly as possible, instead of having a great experience. The only escapism here is getting home. An evening at Whole Foods just might replace an evening at now-defunct Borders. Hmmmm.